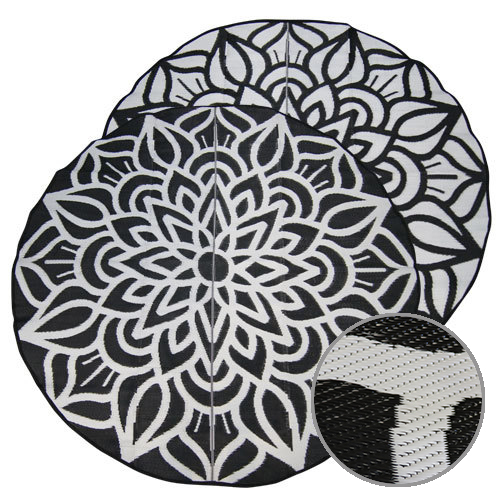 Mandala Designed Recycled Floor Mats - fashionable & easy care. 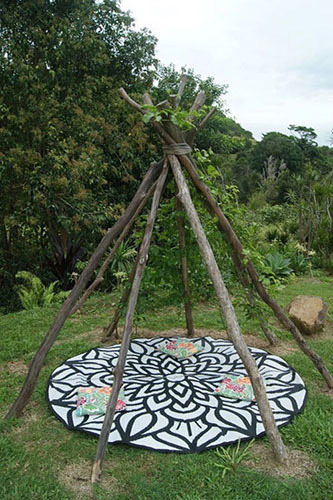 Mandala Design Recycled Mat (2.4m diameter) – Ancestral Connectedness is the name of the concept behind this eye-catching floor mat. Add some design and colour to out outdoor occasion. 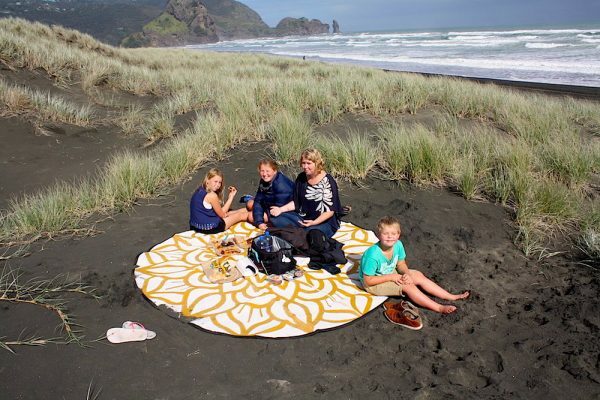 They are ideal as a picnic mat, at the beach, or as a camping mat. 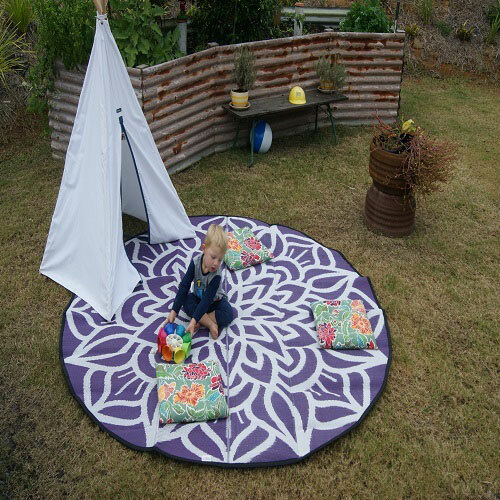 Add one to your glamping supplies for the outdoors! Design by global artist Ify Refini Duley she draws on her Malay, Balinese and Melanesian roots. She uses art to create discussion about our place in the universe. Sacred geometry is key to the mandala concept and reminds us we are all “cosmic diagrams of limitless potential”. 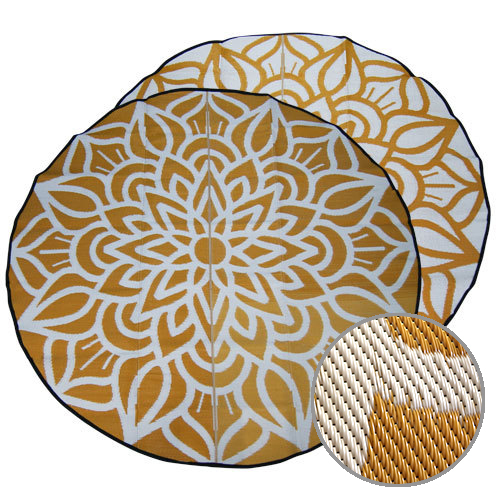 These Mandala designed recycled floor mats are perfect to promote peace not just at home. But also in the chaos of a classroom/community centre, where a designated relaxation area is needed. 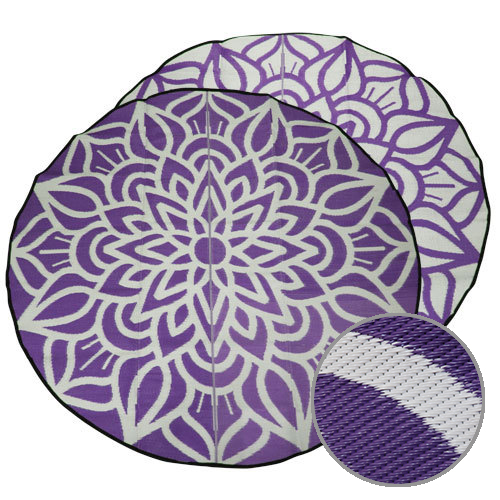 This Mandala design floor mat comes in striking colour combinations of purple/white, black/white and also orange/white. 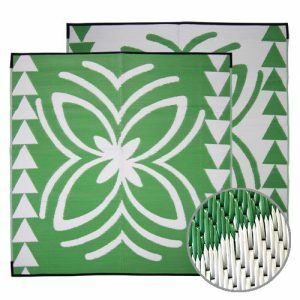 They bring a spiritual, multicultural vibe to your home, office, classroom or camping site. 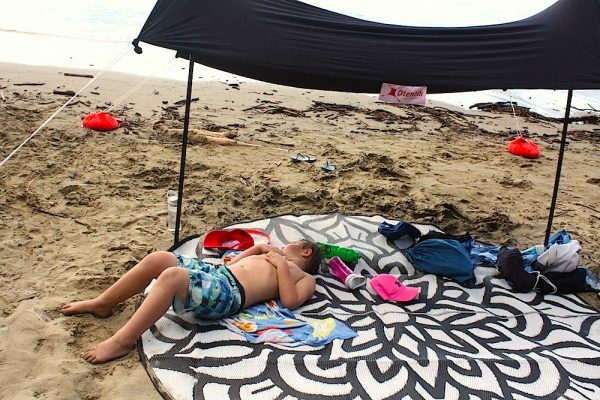 Be the envy of all when relaxing in the outdoors or add to your glamping supplies. 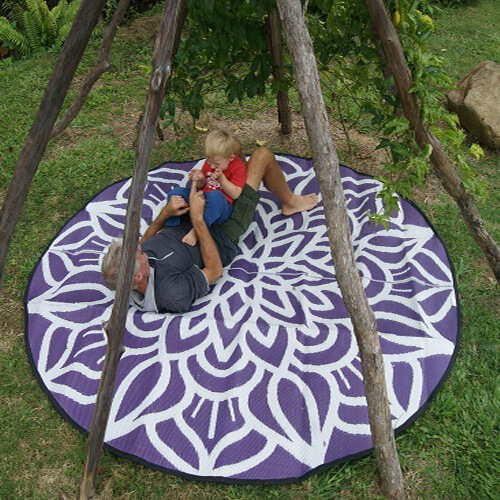 The Mandala mats are also popular as a camping mat, for picnics or at the beach. 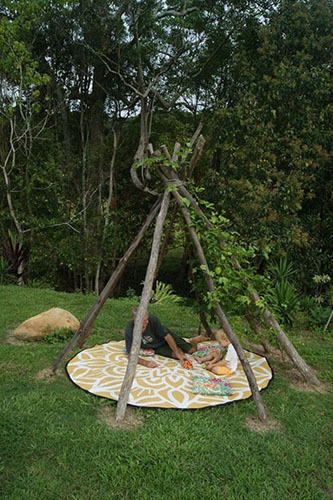 The circular design makes it ideal as a central meeting space or for the sharing of food. 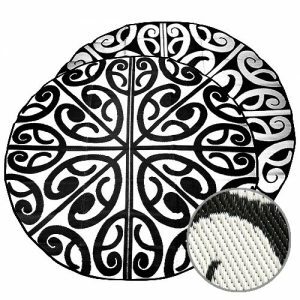 This Mandala floor mat can also be a tool for reconnecting with oneself and increasing self-awareness. Why not extend this to the classroom, encouraging children to reflect on the shapes or trace the lines as they focus their energies? 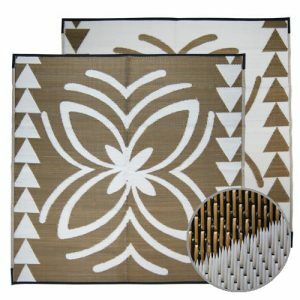 Like all the durable, comfortable floor coverings from Recycled Mats, the Mandala mat is hard wearing and easy to clean. 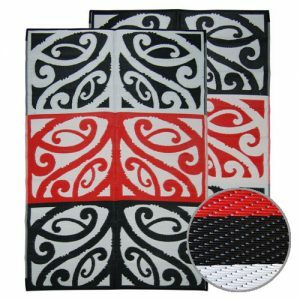 Made from 100% recycled plastics these mats do not compromise on design. 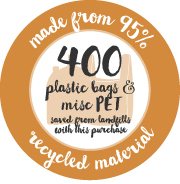 Such as plastic bags and PET bottles, you can celebrate culture whilst doing good for the planet. 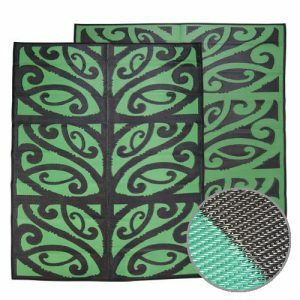 Choose one of these Mandala Designed Recycled Floor Mats for a calming, inspirational floor covering for home, work, the outdoors or add to your glamping supplies to give your camping site that little bit of colour. These tables pair well with one of our Summer Picnic Tables. Colours: Black/White, Orange/White or Purple/White. Origin of artist: Malay, Balinese & Melanesian influences. Thanks Nicki, I love the efficiency of your wonderful company. Parcel has been picked up. Purchased the Cabana for my daughters birthday. I have purchased a few products now and love them all. We live in our motor home and love your mats for outside our door. As for the wonderful pop of color, they shed the water and are very easy to keep clean. The umbrella is a wonderful addition to our lifestyle . Love it for shade and keeping a chilling breeze away. Thanks once again Nicki. Keep those wonderful products coming. Will certainly be back for a replacement mat one day. Cheers Coral ??? 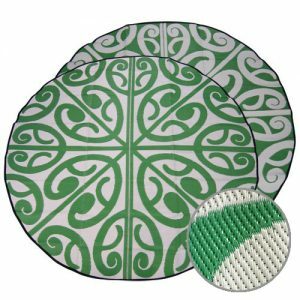 Great product – not only does it look great with the reversible colours, but Nicki also provided great service and kept us informed once it had been sent. Then to my surprise she knew when it had been delivered and followed up to check it had done so safely. I will be back.